The latest breakthrough in nanotech - self-assembling nanobots that go into the human body and perform unheard-of cures. Should you invest? Robotic walking suits - science fiction no longer. But how do you find the gains? SPECIAL BONUS: The Pentagon's push for "directed energy" (Star Wars beams), and the one company with a $1.1 billion backlog in government contracts - more than 3 times what the company is currently selling for. Never in history has the pace of technology accelerated as fast as today. Ideas that used be called "science fiction" are breakthrough realities. And those realities can be turned into millions of dollars for the right investors. On November 5, a man walked up 103 flights of Chicago's iconic Willis Tower, becoming the first human in history to complete the task with a mind-controlled prosthetic leg. Do you know how to get gains from this? A new material that consists of tiny glass pillars could well be the answer to diagnosing cancer and Alzheimer's. Each pillar is speckled on its sides with gold dots and capped with a gold disk. Each pillar is just 1/1,000th the width of a human hair. Is there money in this? You bet. So what do these breakthroughs have in common? The origin of every one starts with the U.S. Military in some form. Just like Velcro... satellite positioning systems... night vision technology... satellite communications... Radar... even laser eye surgery! Owning any one of these could have made you a millionaire many times over. 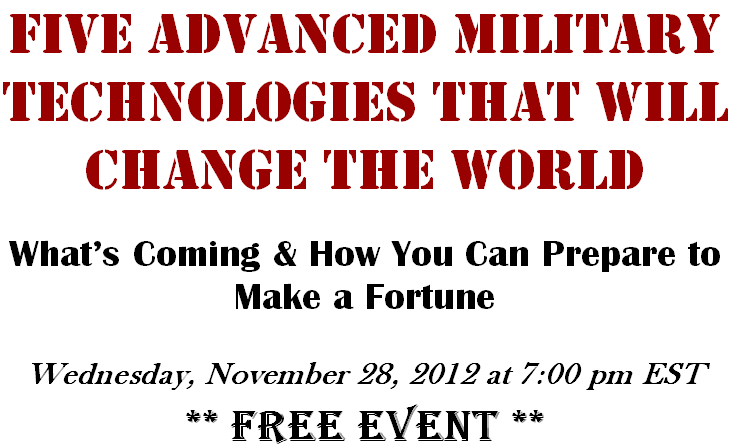 And that's what this special webinar is all about: The Five Advanced Military Technologies That Will Change the World. These next breakthroughs hold the promise of extraordinary new wealth for people. On November 5, a man walked up 103 flights of Chicago’s iconic Willis Tower, becoming the first human in history to complete the task with a mind-controlled prosthetic leg. Do you know how to get gains from this? And no one is better suited to show you the way than Mr. Michael Robinson. We like to call him the "Bob Woodward" of investing. That's because Michael's a veteran journalist, with awards from the AP, UPI, and more. The prestigious Columbia Journalism Review ranked Mr. Robinson among the upper echelons of investigative reporting, right alongside Woodward and Bernstein. Yet today, Mr. Robinson has become one of the most renowned investing analysts, thanks to his background in economics, as well as his technical and fundamental trading techniques. He's amassed an amazing track record, uncovering winners in technology before anyone else even knows they're coming. The secret to unbelievable gains in tech investing (government contracts). Where Military money is going - and what that means to a few small, select companies and their stock prices. The five key technologies that are breaking out and how to play them. One breakthrough company is a screaming buy right now. Mr. Robinson knows and talks with the CEO of this precious firm, and there's a ton of potential that's not even on the balance sheet. This little blockbuster of a firm focuses on surveillance, electronic warfare, ballistic missile defense, and infrastructure security. In anticipation of Obama's reelection, it moved from Army and Marine contracts to Navy business - the biggest area of defense spending. It has a current pipeline of government orders worth more than 3 times its market cap. It's trading at a price that's "beyond ridiculous" cheap. And that's not all: This little millionaire maker has $5 billion in the bid pipeline and, by all industry averages, it can expect to acquire 30% of that - or another $1.5 billion. Mr. Robinson reveals all the details in this Special Web Summit: The Five Advanced Military Technologies That Will Change the World. It could be worth a fortune to you. Simply register for this free event by reserving your place here. You'll immediately receive a confirmation. You'll also receive a reminder the day of the event, along with specific login information. It's easy, quick, and the only way to sit in on this event. There's no obligation. Nothing to buy. It's absolutely free. Just join Mr. Robinson and walk away light years ahead of the investing curve. The window to big gains in 2013 is open right now. This is an opportunity not to be missed. Make sure you register now to reserve your spot at the table. P.S. Never before has a new era in investing ever been this gigantic. Which companies will break out with advanced new technology, and which ones don't stand a chance? Where will military money go? How much? And which stocks will soar? There's never been anything like this. Register now for what promises to be the most entertaining and enlightening conversation you'll hear this year. But please hurry: Open spots are extremely limited. P.P.S. Additional Bonus: Upon reserving your place, you'll also receive Mr. Michael Robinson's twice-weekly technology report at no charge! Nothing published by Money Map Press should be considered personalized investment advice. Although our employees may answer your general customer service questions, they are not licensed under securities laws to address your particular investment situation. No communication by our employees to you should be deemed as personalized investment advice. We expressly forbid our writers from having a financial interest in any security recommended to our readers. All of our employees and agents must wait 24 hours after on-line publication or 72 hours after the mailing of printed-only publication prior to following an initial recommendation. Any investments recommended by Money Morning should be made only after consulting with your investment advisor and only after reviewing the prospectus or financial statements of the company. If you'd like to know more details, please call the number below.